I have been very blessed to have many mentors that have given me sound advice in my career. They have seen my desire to learn, and given me advice on how to grow via skill set and other means. Mentors have helped to continue the learning process to help me grow my career. One of those means has been getting involved in VMware and VMUG communities. 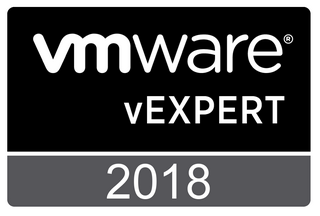 Last week I am honored to share that I was awarded the VMware vExpert VSAN award for my contributions to the community around the vSAN product. Thank you to Corey Romero and his team for all they do to support this community! I have to say this wouldn't be possible without those mentors! They gave me the push I needed to apply for the program and succeed. I have done a lot of promotion of this product through twitter, doing VMUG presentations at local meetings and USERCON events throughout the Midwest. These presentations were based upon my production install experience with VSAN. This will be a short post but I wanted to give some mentoring advice of my own based on my experiences. It's hard to believe that it's almost here already, but VMworld 2017 is just around the corner! It is a very exciting time for those in the virtualization community. There are so many great learning opportunities, with very good speakers on some great topics such as VSAN, VMware on AWS, NSX and many more. I thought I would put together a short post with some of the sessions I plan on attending while I am out there. In the last post we looked at the Plan, in this post we are going to take a look at our Design. We worked with a partner that we gave our requirements on compute and RAM and they came up with the design.